Plantar fasciitis: Inflammation of the plantar fascia, the bowstring-like tissue that stretches from the heel bone to the base of the toes. Plantar fasciitis can be due to calcaneal spurs, which typically cause localized tenderness and pain that is made worse by stepping down on the heel. 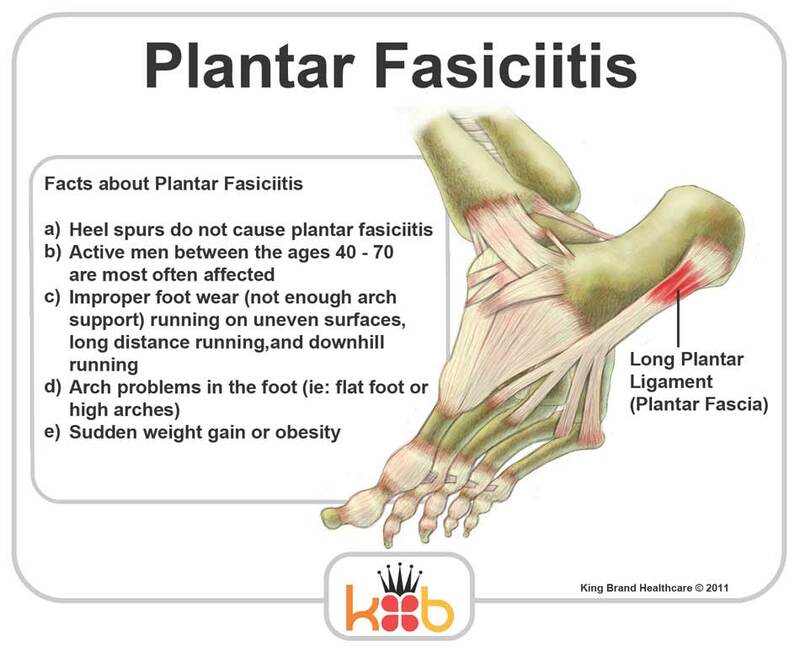 Plantar fasciitis may be related to physical activity overload, abnormal foot mechanics, or may be due to underlying diseases that cause arthritis, such as Reiter disease, ankylosing spondylitis, and diffuse idiopathic skeletal hyperostosis. Treatment is designed to decrease inflammation and avoid reinjury. Icing reduces pain and inflammation. Anti-inflammatory agents, such as ibuprofen and injections of cortisone, can help. Infrequently, surgery is done on chronically inflamed spurs. A donut-shaped shoe insert can take pressure off a calcaneal spur and lessen plantar fasciitis. Excessive stretching of the plantar fascia can result in microtrauma of this structure either along its course or where it inserts onto the medial calcaneal tuberosity. This microtrauma, if repetitive, can result in chronic degeneration of the plantar fascia fibers. The loading of the degenerative and healing tissue at the plantar fascia may cause significant plantar pain, particularly with the first few steps after sleep or other periods of inactivity. The term fasciitis may, in fact, be something of a misnomer, because the disease is actually a degenerative process that occurs with or without inflammatory changes, which may include fibroblastic proliferation. This has been proven from biopsies of fascia from people undergoing surgery for plantar fascia release. Patients experience intense sharp pain with the first few steps in the morning or following long periods of having no weight on the foot. The pain can also be aggravated by prolonged standing or sitting. The pain is usually experienced on the plantar surface of the foot at the anterior aspect of the heel where the plantar fascia ligament inserts into the calcaneus. It may radiate proximally in severe cases. Some patients may limp or prefer to walk on their toes. Alternative causes of heel pain include fat pad atrophy, plantar warts and foreign body. More invasive procedures to treat plantar fasciitis are usually sought only after other treatment has failed to produce favorable results. Corticosteroid injections deliver medicine into the injured fascia to reduce pain. However, this treatment may weaken the plantar fascia and result in further damage. In addition, extracorporeal shock wave therapy (ESWT) is a treatment where sound waves are sent through the damaged tissue in order to stimulate the damaged tissue and encourage healing. This method is relatively new in treating plantar fasciitis and your doctor will be able to tell you if it is the right method for you. Lastly, surgery is the last option for those suffering from chronic or severe plantar fasciitis. Plantar fasciitis is a dull to severe pain in your heel caused by a strain and inflammation of your plantar fascia. The plantar fascia is a scientific name for “foot tissue”. This particular tissue is a ligament attached at one side to the heel bone. At the other side, the tissue fans out to attach at the base of each of your five toes. Plantar fasciitis is the name for the condition that develops when that tissue becomes inflamed. When the plantar fascia is excessively stretched, micro-tears can occur, causing this swelling and subsequent pain. Plantar fasciitis tends to strike those who overtrain, neglect to stretch their calf muscles, or overdo hill work and speedwork. Plantar fasciitis can also be caused by biomechanical flaws, including flat, high-arched feet and a tight Achilles tendon; excessive pronation; sudden increases in training mileage; beginning speedwork; wearing worn running shoes; running on hard surfaces, like asphalt or concrete; or wearing high heels all day before switching into flat running shoes. Plantar fasciitis and heel spur pain usually begins in the bottom of the heel, and frequently radiates into the arch. At times, however, the pain may be felt only in the arch. The pain is most intense when first standing, after any period of rest. Most people with this problem experience their greatest pain in the morning, with the first few steps after sleeping. After several minutes of walking, the pain usually becomes less intense and may disappear completely, only to return later with prolonged walking or standing. If a nerve is irritated due to the swollen plantar fascia, this pain may radiate into the ankle. In the early stages of Plantar Fasciitis and Heel Spurs, the pain will usually subside quickly with getting off of the foot and resting. As the disease progresses, it may take longer periods of time for the pain to subside. If you see a doctor for heel pain, he or she will first ask questions about where you feel the pain. If plantar fasciitis is suspected, the doctor will ask about what activities you’ve been doing that might be putting you at risk. The doctor will also examine your foot by pressing on it or asking you to flex it to see if that makes the pain worse. If something else might be causing the pain, like a heel spur or a bone fracture, the doctor may order an X-ray to take a look at the bones of your feet. 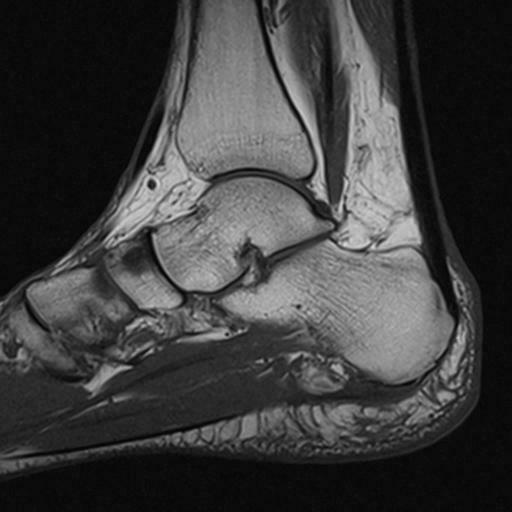 In rare cases, if heel pain doesn’t respond to regular treatments, the doctor also might order an MRI scan of your foot. The good news about plantar fasciitis is that it usually goes away after a few months if you do a few simple things like stretching exercises and cutting back on activities that might have caused the problem. Taking over-the-counter medicines can help with pain. It’s rare that people need surgery for plantar fasciitis. Doctors only do surgery as a last resort if nothing else eases the pain. Surgery should be reserved for patients who have made every effort to fully participate in conservative treatments, but continue to have pain from plantar fasciitis. Patients should fit the following criteria. Symptoms for at least 9 months of treatment. Participation in daily treatments (exercises, stretches, etc.). If you fit these criteria, then surgery may be an option in the treatment of your plantar fasciitis. Unfortunately, surgery for treatment of plantar fasciitis is not as predictable as a surgeon might like. For example, surgeons can reliably predict that patients with severe knee arthritis will do well after knee replacement surgery about 95% of the time. Those are very good results. Unfortunately, the same is not true of patients with plantar fasciitis. How Can You Treat Bursitis Of The Foot?